London to Germany by high-speed train. You can add up to 2 stopovers of up to 48h each, just click Add intermediate stops. Why not stop off in Brussels or Cologne? 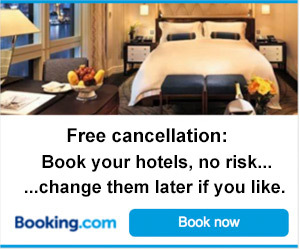 Book hotels at booking.com with free cancellation before train bookings open. 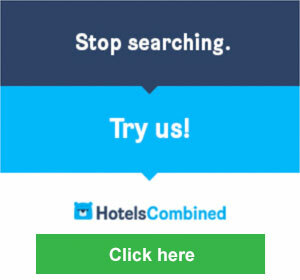 Or use hotelscombined.com for price comparison, a remarkable site. It's easy to travel from London to Germany by train. Take Eurostar from London to Brussels in just 2h00, switch to a Thalys or ICE high-speed train from Brussels to Cologne in 1h57, then take a luxurious ICE high-speed train from Cologne to Munich, Berlin or anywhere in Germany. It's affordable too, with fares from €59.90 from London to Germany, city centre to city centre, no baggage fees, no airport taxes, children under 4 go free, there's free WiFi on board, and you can bring your own bottle of wine along if you like. This page will explain the best routes, train times, & how to buy tickets. DB (Deutsche Bahn), see www.bahn.de for train times, fares & online tickets within Germany. 4 January 2019. Train times valid 9 Dec 2018 to 14 Dec 2019. There are two main options for travel between the UK and Berlin or Hanover. Option 1, by Eurostar & high-speed daytime trains: Travel by high-speed train from London to Brussels, Cologne, then Hannover & Berlin from as little as €69.90 each way. Option 2, by Harwich-Hoek overnight ferry with private cabin with shower, toilet & satellite TV, then daytime trains from Holland to Berlin. It's easy to travel by train from London to Berlin all in one day from just €69.90 in 2nd class or €129.90 in 1st class, using a morning Eurostar to Brussels, a high-speed Thalys or ICE3 train to Cologne, then Germany's luxurious high-speed ICE2 onwards to Berlin. Pride of the German Railways, ICEs travel at up to 280km/h (175 mph). 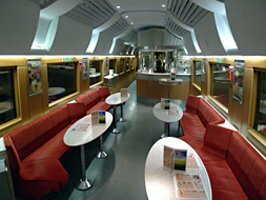 This route is served by second-generation ICE2s, with a cafe-bar and restaurant serving proper sit-down meals. Breakfast in the ICE restaurant car costs about £8, a three-course meal with a couple of glasses of beer about £25. Treat yourself! 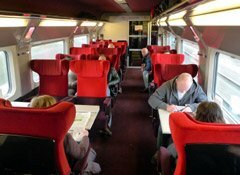 There are power sockets at all seats & free WiFi on both Eurostar, Thalys & ICE. How to read these timetables... It's very simple, you read downwards, each column is a journey you can take. You change trains at each grey bar. From 13 January to 17 May 2018, Cologne-Berlin ICE trains will take a bit longer due to trackwork. Eastbound, a temporary timetable will apply. Westbound, they will leave Berlin earlier (for example, 06:20 instead of 06:50. Check times for your date online at www.bahn.de. * On Mondays & Fridays from 31 March to mid-September 2019, the 06:47 Eurostar runs EARLIER, leaving London 06:13, arriving Brussels 09:22. ** Runs on Fridays & Sundays only until 6 April 2019, then runs every day from 7 April 2019 onwards. c = by high-speed ICE train with Sparpreis London fares from €69.90 available from London to Berlin or anywhere in Germany. t = by high-speed Thalys train. Shaded = time-effective journey with overnight hotel stop in Brussels or Cologne. By all means choose an earlier Eurostar outbound or a later morning one westbound. In Brussels, try the Ibis Brussels Midi just across the road from the station or the Pullman Hotel Brussels Midi, a more upmarket option above the station itself. In Cologne, try the Breslauer Hof Am Dom, Hotel Domspitzen, CityClass Hotel Europa am Dom, Hilton Cologne, Excelsior Hotel Ernst am Dom. Brussels Midi station info & advice on changing trains Cologne Hbf station guide Berlin Hbf station guide & map Hbf = Hauptbahnhof = main station. 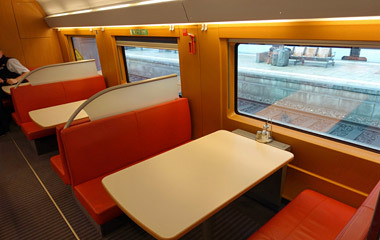 If you have a 1st class ticket (but not super-sparpreis) you can use the DB Lounges at Cologne Hbf, Berlin Hbf & Hanover. 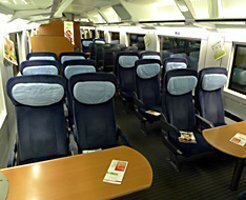 London to Berlin or any other city in Germany starts at €69.90 each way 2nd class or €129.90 in 1st class with a German Railways Sparpreis London fare. Fares work like air fares, prices increasing as the cheaper tickets are sold, often cheaper mid-week than Fridays, usually cheaper in November than June. So book early and hunt around for the cheapest departures. No changes to travel plans, limited refunds with a Sparpreis London fare. Sparpreis London fares are only available if you use German ICE trains between Brussels & Cologne. If you want to use Thalys, fares from London to Cologne start at £50 one-way or £89 return, then you can add a German railways domestic sparpreis ticket between Cologne & Berlin from €29 each way. This tends to make using Thalys more expensive, though not always. You can easily buy a cheap Sparpreis London fare between London and Berlin or anywhere in Germany direct from German Railways website www.bahn.de using the special links below. All you need to do is enter your date of travel. Anyone from any country can book this way, as international credit cards are accepted and you print your own online ticket. I recommend buying a round trip as two one-ways as it's easier to see where the availability is. I recommend registering when prompted so you can log in and check your bookings or re-print tickets at any time. Booking normally opens 92 days before departure, but this is progressively being extended to 6 months before departure. You can't buy tickets before booking opens. Remember that the 92 days can get squeezed to as little as 60 days for dates immediately after the Europe-wide timetable changes in mid-June and mid-December. Seat reservations: A seat reservation on the Eurostar is automatically included with your Sparpreis London ticket free of charge. 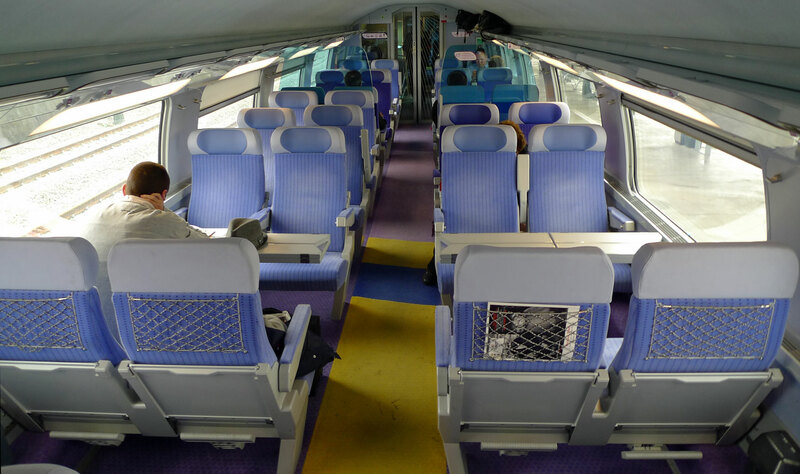 Seat reservations are optional on ICE trains, if you want a reserved seat it can be added during the booking process for fee of around €4.50 each way. You only pay 1 fee to reserve a seat on both ICEs. Stopovers: As with other German Railways sparpreis fares, Sparpreis London fares allow up to 2 stopovers of up to 48 hours each to be incorporated in your booking using the Add intermediate stops link. You simply specify the duration of the stopover in hours & minutes in the hh:mm box. Why not stop off in Brussels or Cologne? You need to specify a credit card as supporting ID if you want to print your own ticket, and show this credit card to the conductor on board the train - though this needn't be the same card you use to pay for the ticket. You don't need any form of ID if you order tickets by post for a small extra fee. How to buy a connecting ticket from other UK towns & cities: See the advice on special add-on tickets here. You'll only find these Sparpreis London fares on services which use the German ICE train between Brussels & Cologne marked with a 'c' in the timetable above, they aren't available on an journey involving a Thalys train, marked 't'. Sparpreis London tickets are only valid on the specific trains you book, no changes to travel plans, limited refunds. However, as it's a through ticket, in the unlikely event of a delay & missed connection, you'll be re-booked on a later onward train at no extra charge. To find a Sparpreis London fare using www.bahn.de, you sometimes need to click add stopovers and enter Brussels South Stn in the via box and either 01:00 or 02:00 in the stopover box to force the journey planner to find the ICE connection (and so offer a Sparpreis London fare) rather than finding a more immediate Thalys connection. I've set up the links above to include this necessary 'fiddle factor' for each specific departure, so you don't need to worry about it, as long as you use the right link for the right departure. Step 1, buy a Eurostar ticket from London to Brussels at www.eurostar.com using the train times on this page as a guide. The further ahead you book, the more likely you are to see the cheapest fares. Tickets can be self-printed, collected at London St Pancras or posted to any UK address. If you buy direct from Eurostar you get the chance to select an exact seat on board the Eurostar using the Manage a booking link on their home page after you've bought your ticket. Step 2, now buy a ticket from Brussels to Berlin using the journey planner at the German Railways website www.bahn.de, again using the train times on this page as a guide. They have Sparpreis Belgium tickets between Brussels and anywhere in Germany from just €39 each way, and you simply print out your own ticket. I recommend registering when it asks you before completing the purchase, so you can easily retrieve any bookings. Option 1, you can easily book from London to Berlin using www.loco2.com. This links to both German Railways and French Railways systems, so can sell you a London to Berlin journey as one transaction incorporating a London-Cologne tickets sourced from the French system plus a Cologne to Berlin ticket sourced from the German system. In fact, it also sells Sparpreis London tickets via the ICE, so you'll see all departures this way. An added benefit is that Loco2 allows you to book through from any British station, not just London. Option 2, you can buy London to Cologne tickets at the Belgian Railways site www.b-europe.com. You can then add a Cologne-Berlin ticket at the German Railways website, www.bahn.de. In all cases, you simply print out your own ticket. Make sure the train you book connects with the Eurostar+Thalys you have booked, using the train times on this page as a guide. At bahn.de I recommend registering when it asks you before completing the purchase, so you can easily retrieve any bookings. To book by phone, call Deutsche Bahn's UK telesales line on 08718 80 80 66 (lines open 09:00-20:00 Monday-Friday, 09:00-13:00 Saturdays & Sundays, no booking fee, 2% credit card charge). Click here for a list of agencies and more information on how to buy tickets. For holidays or short breaks to Germany by train call rail specialists Railbookers. They offer custom-made holidays & tours to Germany with trains, transfers & hotels sorted for you in one place. And as they're selling you a package they'll look after you if anything happens such as a strike or major delay. One of their most popular trips is a short break by train from the UK to Cologne & Berlin, customisable to add extra nights, with train travel throughout and no flying necessary. Another top seller is their holiday to Berlin & Prague, also with travel to & from London by train so no flying necessary. Finally, have a look at their Ultimate Berlin, Prague, Vienna, Budapest - this is by train on the outward leg from the UK, but can easily be customised to include train travel from Budapest back to London. Escorted tours: If you'd like to travel with a convivial group of travellers escorted by a professional tour guide, the operators to check are Great Rail Journeys (www.greatrail.com, in the UK call 01904 527 120) and Rail Discoveries, www.raildiscoveries.com, 01904 730 727. Both have various escorted tours from the UK to Germany by train, with departures on a variety of dates. Cologne, or Köln in German from its Roman name, Colonia Claudia Ara Agrippinensium, was once the largest city in Germany. Its magnificent cathedral stands right next to Cologne's main station - the cathedral was consecrated in 1322, but its distinctive 512 feet high towers were only completed in 1880. You can climb them for a magnificent view over the city and the River Rhine. Getting to Cologne from London is really easy by train: Hop on a high-speed Eurostar train from London to Brussels in just 1 hour 55 minutes, then travel from Brussels to Cologne by high-speed Thalys train or German high-speed ICE train in just 1 hour 57 minutes more. There are power sockets at all seats and free WiFi. Frequent regional trains then link Cologne with Düsseldorf, Essen, Bochum & Dortmund. Thalys is a consortium of the French, Belgian & Dutch railways formed to run the high-speed trains between Paris, Brussels, Amsterdam & Cologne. Watch the London to Cologne video. 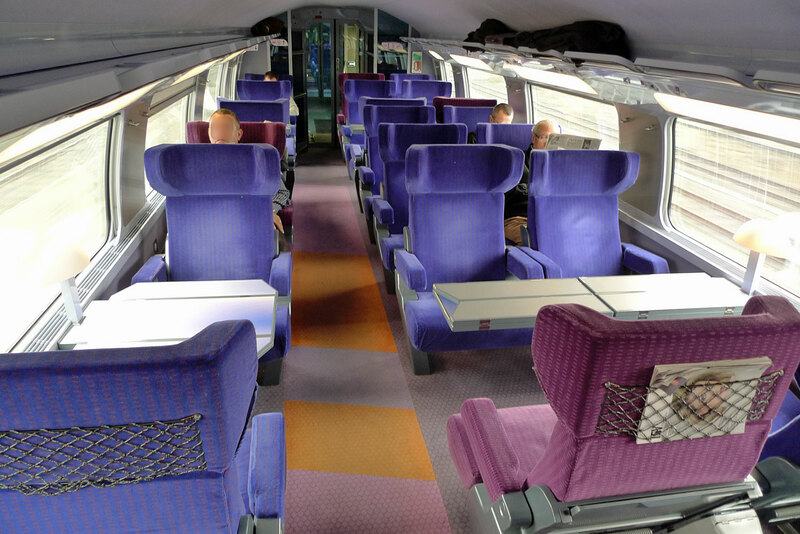 Standard (2nd) class seats on Thalys. 1st class (Comfort or Premium) seats. A Thalys at Brussels. Thalys info. ...or a German ICE high-speed train to Cologne in 1 hour 57 minutes more. ICE3 1st class, with real leather seats. All ICE seats have power sockets. An ICE to Cologne & Frankfurt waiting to leave Brussels Midi. More ICE info. Always check times online for your date of travel as times can vary, especially the Eurostar connection. Duisburg, Essen & Bochum are also stops on the Cologne-Düsseldorf-Dortmund regional trains shown here, simply use www.bahn.de to check calling times. If your Thalys or ICE arrives promptly, you may find an earlier onward train to Düsseldorf or Dortmund in addition to the ones shown here. Hbf = Hauptbahnhof = main station. If you have a first class ticket (but not super-sparpreis) you can use the DB Lounges at Cologne or Düsseldorf. * On Mondays & Fridays from 31 March until mid-September 2019 the 06:47 Eurostar runs EARLIER, leaving London 06:13, arriving Brussels 09:22. ** Runs on Fridays only until 6 April 2019, runs every day from 7 April 2019 onwards. c = by high-speed ICE train with Sparpreis London fares from €59.90 available from London to Cologne or anywhere in Germany, watch the London to Cologne video. d = the 19:25 Thalys from Brussels runs direct to Düsseldorf, Duisburg, Essen & Dortmund as shown, no need to change in Cologne. e = the 17:27 Thalys from Brussels runs direct to Düsseldorf, Duisburg, Essen & Dortmund as shown, no need to change at Cologne. f = the 08:44 Thalys from Cologne runs direct from Dortmund, Essen, Duisburg & Düsseldorf as shown, no need to change in Cologne. g = the 16:43 Thalys from Cologne runs direct from Dortmund, Essen, Duisburg & Düsseldorf as shown, no need to change in Cologne. h = the 13:25 Thalys from Brussels runs direct to Düsseldorf, Duisburg & Essen as shown (only Dusseldorf on Saturdays), no need to change in Cologne. Change in Brussels onto Eurostar - remember the 30 minute Eurostar check-in! 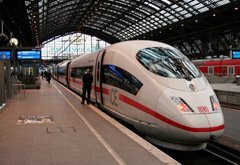 London to Cologne, Düsseldorf, Dortmund or any other city in Germany starts at €59.90 each way 2nd class or €109.90 in 1st class with a German Railways Sparpreis London fare from www.bahn.de. Sparpreis London fares are only available if you use German ICE trains between Brussels & Cologne. If you want to use Thalys, fares from London to Cologne start at £50 one-way or £89 return with a special through ticket bought online at www.eurostar.com. There are several different ways to buy tickets from London to Frankfurt, and as each works in a different way with different prices and quotas, it's a good idea to try each of them. Civilised! Lunch in the ICE's bistro car. 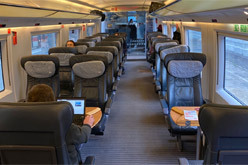 There's free WiFi on board, too..
Before you do anything else, check the German Railways website for cheap Sparpreis London fares between London and anywhere in Germany, including Cologne, Düsseldorf, Essen or Dortmund, using the special links below. All you need to do is enter your date of travel. I recommend buying a round trip as two one-ways, as it's easier to see where the availability is. Booking normally opens 92 days before departure, but this is progressively being extended to 6 months before departure. These tickets are only available via the ICE between Brussels & Cologne, not Thalys. About these Sparpreis London tickets: These excellent Sparpreis London tickets start at €59.90 each way 2nd class or €109.90 1st class from London to anywhere in Germany. That price includes Eurostar to Brussels, a superb German ICE train to Cologne and onward trains to your final destination, all on one ticket. You'll only find these Sparpreis London fares on services which use the German ICE train between Brussels & Cologne (marked with a 'c' in the timetable above), they aren't available on Thalys trains. Availability is limited, and these Sparpreis London fares can sell out. And it can't sell tickets of any sort for Eurostar+Thalys. Incidentally, note that when using www.bahn.de, you often need to put 'Brussels South Stn' in the 'via' box and either 01:00 or 02:00 in the 'stopover' box to force the journey planner to find the ICE connection (and so offer the cheap Sparpreis London fares) rather than a more immediate Thalys connection. I've set up the 'check for cheap tickets' links above to include the necessary fiddle factor for each specific departure, so you don't need to worry about it, as long as you use the right link for the right departure. If you find a cheap ticket using the links above then great, if not (or if you want a Eurostar+Thalys service), move swiftly on to the normal 'How to buy tickets' section below... See Brussels Midi station information & advice on changing trains there. 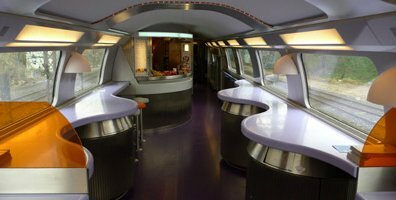 www.b-europe.com has the major advantage that it can sell both Eurostar + Thalys and Eurostar + ICE. It accepts all international credit cards so anyone from any country can book this way. It simply adds the cheapest fare for the London-Brussels Eurostar with the cheapest onward fare for the Thalys or ICE, but will also offer DB's Sparpreis London fare if that's cheapest. You can print your e-ticket on A4 paper (Letter size paper is fine) or download the SNCB Europe app and show the e-ticket on your smartphone. You can of course book each train separately with the relevant operator, giving you maximum control and the maximum choice of (for example) seating options. First book the London-Brussels Eurostar at www.eurostar.com with self-print tickets. Then book Brussels-Cologne with either www.thalys.com (if it's a Thalys) or www.bahn.de (if it's an ICE), both offer self-print tickets. Remember to allow for the 30 minute Eurostar check-in at Brussels on the return journey. If you prefer to book by phone, call Deutsche Bahn's UK telesales line on 08718 80 80 66 (lines open 09:00-20:00 Monday-Friday, 09:00-13:00 Saturdays & Sundays, no booking fee, 2% credit card charge). Click here for a list of agencies and more information on how to buy tickets. For holidays or short breaks to Germany by train call rail specialists Railbookers. They offer custom-made holidays & tours to Germany with trains, transfers & hotels sorted for you in one place. And as they're selling you a package they'll look after you if anything happens such as a strike or major delay. One of their most popular trips is a short break by train from the UK to Cologne & Berlin, customisable to add extra nights, with train travel throughout and no flying necessary. High-speed Eurostar trains link London with Brussels in just 2 hours. From Brussels, high-speed Thalys and ICE trains take 1h55 to reach Cologne - watch the London to Cologne video. Regular trains link Cologne with Bonn, Koblenz and Mainz running via the original scenic rail route along the Rhine Valley. Simply use the London-Cologne timetable above to find train times from London to Cologne, then use www.bahn.de to find connecting train times along the Rhine Valley from Cologne to Bonn, Koblenz and Mainz. Before you do anything else, check the German Railways website for cheap Sparpreis London fares between London and anywhere in Germany, including Koblenz, Bonn or Mainz, using the special links below. All you need to do is enter your date of travel. I recommend buying a round trip as two one-ways, as it's easier to see where the availability is. Booking normally opens 92 days before departure, but this is progressively being extended to 6 months before departure. About these Sparpreis London tickets: These excellent Sparpreis London tickets start at €59.90 each way 2nd class or €109.90 1st class from London to anywhere in Germany. That price includes Eurostar to Brussels, a superb German ICE train to Cologne and onward trains to your final destination, all on one ticket. You'll only find these Sparpreis London fares on services which use the German ICE train between Brussels & Cologne (marked with a 'c' in the timetable above), they aren't available on Thalys trains. Availability is limited, and these Sparpreis London fares can sell out. It can't sell tickets of any sort for Eurostar+Thalys. Incidentally, note that when using www.bahn.de, you often need to put 'Brussels South Stn' in the 'via' box and either 01:00 or 02:00 in the 'stopover' box to force the journey planner to find the ICE connection (and so offer the cheap Sparpreis London fares) rather than a more immediate Thalys connection. I've set up the 'check for cheap tickets' links above to include the necessary fiddle factor for each specific departure, so you don't need to worry about it, as long as you use the right link for the right departure. If you find a cheap ticket using the links above then great, if not (or if you want a Eurostar+Thalys service), move swiftly on to the normal 'How to buy tickets' section below... See Brussels Midi station information & advice on changing trains there. 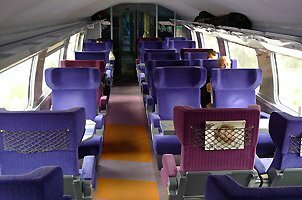 www.b-europe.com has the major advantage that it sells both Eurostar+Thalys and Eurostar+ICE, with print-at-home tickets. It accepts all international credit cards, so anyone from any country can book this way. It simply adds the cheapest fare for the London-Brussels Eurostar with the cheapest onward fare for the Thalys or ICE, although of course you'll sometimes find that a London-Germany through fare from Bahn.de/en is cheaper. Then book Brussels-Cologne with either www.thalys.com (if it's a Thalys) and use www.bahn.de for the onward German train from Cologne to Bonn or Mainz. 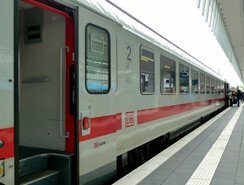 Or use www.bahn.de (if it's an ICE) to book from Brussels straight through to Bonn or Mainz. Both sites offer self-print tickets. Remember to allow for the 30 minute Eurostar check-in at Brussels on the return journey. If you prefer to buy tickets by phone, call Deutsche Bahn's UK phone line on 08718 80 80 66 (lines open 09:00-20:00 Monday-Friday, 09:00-13:00 Saturday & Sunday, no booking fee, 2% credit card charge). Click here for a list of agencies and more information on how to buy tickets. 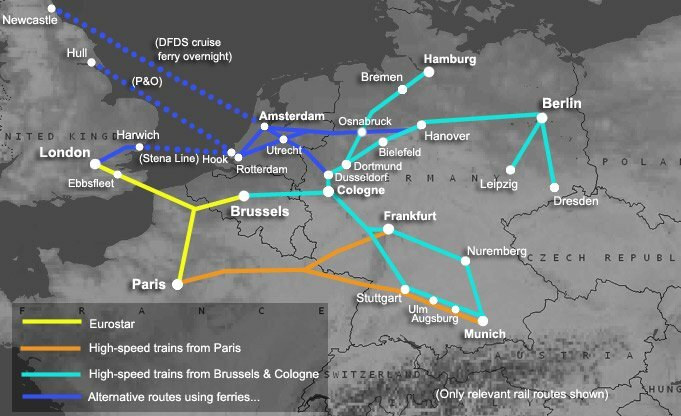 You can travel from London to Frankfurt either via Paris or via Brussels. Both routes usually involve just a single change of train, from Eurostar to a top-quality German ICE high-speed train, and both routes offer cheap fares if you book well in advance. The change in Paris involves a 10-minute walk between Paris Nord and Paris Est, the change in Brussels is an easy same-station change. The choice is yours. Both Eurostar & ICE have power sockets at all seats & free WiFi. The TGV-Est high-speed line opened in June 2007 with the final section opening in July 2016. 200 mph high-speed trains now link Paris and Frankfurt in as little as 3 hours 38 minutes, city centre to city centre. Some Paris-Frankfurt departures are operated by German ICE3 trains which are amongst the most comfortable high-speed trains in Europe, watch the ICE video guide. Those marked with a 't' in the timetable below are operated the impressive double-decker French TGV Duplex, see the video guide. This route is easy to book online using www.loco2.com. Shaded = time-effective journey with overnight hotel stop in Paris. Suggested hotels near Gare du Nord & Gare de l'Est. By all means choose an earlier Eurostar outbound or a later morning one westbound. t = By French TGV Duplex, all other Paris-Frankfurt trains are German ICE3. If you have a first class ticket (but not super-sparpreis) you can use the DB Lounge at Frankfurt am Main Hauptbahnhof. London St Pancras station guide Paris Gare du Nord station guide Paris Gare de l'Est station guide. Advance-purchase fares from €39 each way 2nd class, €69 1st class. The easiest & cheapest way to buy London-Frankfurt train tickets for journeys via Paris is online at www.loco2.com. Booking for Eurostar & the Paris-Frankfurt trains usually opens 120 days ahead, up to 180 days ahead for German domestic trains, but only 92 days ahead for French domestic trains. Using www.loco2.com, you can buy tickets to Frankfurt not just from London, but from any station in Britain. www.loco2.com can book journeys to Frankfurt via both Brussels or Paris. If you specifically want the Paris route, simply click '+ Add via/stopover' and enter Paris Nord as a 'via'. It connects to both the French & German railways ticketing systems. It's also worth checking prices for the Paris-Frankfurt train on www.bahn.de, as this is the German reservation system and prices vary from those on the French system. In addition, child age limits are more generous if you book using bahn.de: Children under 6 go free, and children under 15 can also go free if accompanying an adult. Booking this way involves two websites, so do a dry run first on both sites to check prices and availability before booking for real. Step 1, go to www.bahn.de, the German Railways website, and book from Paris to Frankfurt & back. The results will show cheap Sparpreis fares (if available). You pay by credit card and simply print out your own ticket. Easy! The prices shown on www.bahn.de are in euros, and are the total cost for all passengers selected, not per person. I recommend registering when it asks you before completing the purchase, so you can easily retrieve any bookings later. 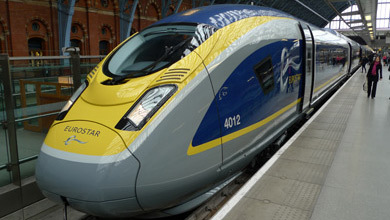 Always book this train first and check its exact arrival & departure times before booking the Eurostar connection, as times can vary. Step 2, go to www.eurostar.com to buy your Eurostar ticket between London & Paris, using the Eurostar times above as a guide. By all means book an earlier Eurostar outwards, or a later Eurostar on the way back, if this has cheaper seats available of if you'd like to stop off in Paris for a while. Eurostar tickets can be sent to any UK address, self-printed, or collected at the station. If you prefer to book the journey via Paris by phone, call International Rail on 0844 248 248 3, lines open 09:00-17:00 Mondays-Fridays. High-speed Eurostar trains link London with Brussels in just 2 hours. From Brussels, there high-speed ICE trains to Frankfurt taking just 3 hours 15 minutes, or you can take a more frequent high-speed Thalys train to Cologne and change there for an ICE to Frankfurt. London-Frankfurt by Eurostar & ICE starts at €59.90 each way, booked online at www.bahn.de, see the London to Frankfurt video. The scenic route... However, although the high-speed line from Cologne to Frankfurt cuts a 2-hour journey to just 1 hour, you may prefer the old scenic route running right along the Rhine Valley, past cliffs and castles and the fabled Lorelei Rock. If so, simply go to www.bahn.de, click Add intermediate stops and enter Koblenz in the via box (leaving duration as zero) to get a journey via the Rhine Valley journey, see the Rails Down the Rhine page for more information, photos & video. ICE3 1st class, with real leather seats. Staff provide at-seat service of drinks & food. The 12:25 ICE to Frankfurt waits to leave Brussels Midi. More info about ICE. How to read these timetables... Each column is a service, and you read downwards. There's normally a change of trains at each of the grey bars. ** Runs on Fridays & Sundays only until 6 April 2019, runs every day from 7 April 2019 onwards. c = by direct high-speed ICE train between Brussels & Frankfurt, with Sparpreis London fares from €59.90 available from London to Frankfurt via this service, watch the London to Frankfurt video. 3D virtual tour. Brussels-Cologne trains not marked 't' are Thalys. Map of Frankfurt showing the Hauptbahnhof (Hbf) Hbf = Hauptbahnhof, meaning main station. Evening departure from London & overnight stop in Brussels? You can also catch an evening Eurostar to Brussels, stay overnight, continue next morning. For space reasons, this isn't shown here, but you can easily check times & prices using the Sparpreis London links below. You can double-check these train times using www.bahn.de. See Brussels Midi station guide & advice on changing trains there. If you have a first class ticket (but not super-sparpreis) you can use the DB Lounge at Frankfurt. London St Pancras station guide. There are several different ways to buy tickets from London to Frankfurt, and as each works in a different way with different prices & quotas, it's a good idea to try each of them. 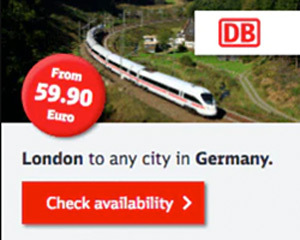 Before you do anything else, check the German Railways (DB) website for cheap Sparpreis London fares between London and anywhere in Germany, including Frankfurt, using the special links below. Only journeys using ICE between Brussels and Cologne can be booked this way, not Thalys. All you need to do is enter your date of travel. I recommend buying a round trip as two one-ways, as it's easier to see where the availability is. It's also good to register, so you can log in and reprint tickets as necessary. Booking normally opens 92 days before departure, but this is progressively being extended to 6 months before departure. Departing London at 19:34 every day as above, but with more civilised 08:23 departure from Brussels next morning. Departing London at 19:34 every day as above, but with more leisurely 10:25 departure from Brussels next morning. Belgian Railways excellent site www.b-europe.com can book tickets from London to Frankfurt via both Eurostar+ICE and Eurostar+Thalys. They show DB's Sparpreis fares too, although not Eurostar's through fares. Look carefully at the journey options it offers, you'll see some options which add an extra change at Liege just to save a euro or two, I'd recommend sticking with just one change in Brussels, or Brussels and Cologne. www.b-europe.com looks at the cheapest fare for each train and adds them together. Which is great, but sometimes a through fare sold by bahn.de will be cheaper, so it's still worth checking those too. Step 1, go to www.eurostar.com and buy the Eurostar ticket from London to Brussels & back. Tickets can be posted to any UK address, self-printed or collected at St Pancras station in London. Step 2, go to www.bahn.de, the German Railways website, and book the ICE train from Brussels to Frankfurt & back, making sure you pick the direct Brussels-Frankfurt train. Fares from €39 each way. You want Brussels Zuid (Brussels South) if prompted. Step 1, buy a London-Cologne ticket online at www.b-europe.com. Bookings open up to 180 days before departure, book early for the cheapest fares. You simply print off your own ticket. You can also try www.loco2.com. Or of course, you can book the Eurostar at www.eurostar.com and the Thalys separately at www.thalys.com. Step 2, now buy your Cologne-Frankfurt ticket online at the German Railways website, www.bahn.de. Fares start at €29 each way. I recommend registering when prompted, as you can then retrieve any bookings later. You simply print out your own Online Ticket. If you prefer to book by phone, call Deutsche Bahn's UK phone line on 08718 80 80 66 (lines open 09:00-20:00 Monday-Friday, 09:00-13:00 Saturday & Sunday, no booking fee, 2% credit card charge). Click here for a list of agencies and more information on how to buy tickets. High-speed Eurostar trains link London with Brussels in just 2 hours. From Brussels, ICE high-speed trains run to Frankfurt in around 3h05, watch the video guide. Change in Frankfurt for Nuremberg (Nürnberg in German), taking just 2h05. Eurostar has a cafe-bar, ICEs have a bistro-restaurant car, and both Eurostar & ICE come with power sockets at all seats & free WiFi. Travel from London to Brussels by Eurostar, leaving London St Pancras at 06:47 (06:13 on some Mondays & Fridays, 06:57 on Saturdays), arriving Brussels Midi at 10:07 (09:22 on some Mondays & Fridays). Travel from Brussels to Frankfurt by high-speed ICE train leaving Brussels Midi at 10:25 and arriving Frankfurt at 13:31 (at weekends, you'd change at Frankfurt Flughafen). 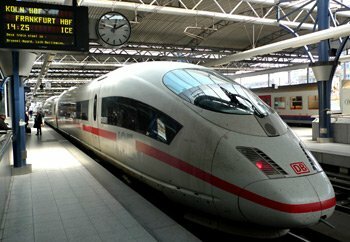 Travel from Frankfurt to Nuremburg by high-speed ICE train leaving Frankfurt at 13:54 and arriving Nuremburg at 15:59. Travel from London to Brussels by Eurostar, leaving London St Pancras at 10:58, arriving Brussels Midi at 14:05. Travel from Brussels to Frankfurt by high-speed ICE train leaving Brussels Midi at 14:25 and arriving Frankfurt Flughafen at 17:09. 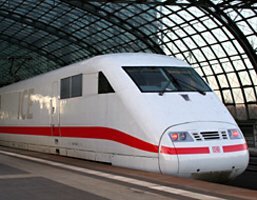 Travel from Frankfurt to Nuremburg by high-speed ICE train leaving Frankfurt Flughafen at 17:36 and arriving Nuremburg at 19:59. Travel from London to Brussels by Eurostar, leaving London St Pancras at 15:04, arriving Brussels Midi at 18:05. Travel from Brussels to Frankfurt by high-speed ICE train leaving Brussels Midi at 18:25 and arriving Frankfurt at 21:31. Travel from Frankfurt to Nuremburg by Intercity train leaving Frankfurt at 22:21 and arriving Nuremburg at 00:44. You can in fact take any service from London to Cologne (see the Cologne section above) then use www.bahn.de to find a connecting train from Cologne to Nuremberg. However, the options shown here are arguably the best, and usually have the cheapest fares. 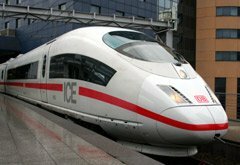 Travel from Nuremburg to Frankfurt by high-speed ICE train leaving Nuremberg at 06:00 Mondays-Saturdays and arriving Frankfurt Flughafen at 08:22. Travel from Frankfurt to Brussels by high-speed ICE train leaving Frankfurt Flughafen at 08:31 and arriving Brussels Midi at 11:35. Travel from Brussels to London by Eurostar, leaving Brussels Midi at 12:52 Mondays-Saturdays only, arriving London St Pancras at 14:05. 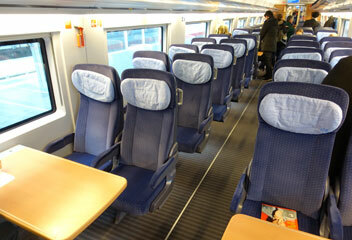 Travel from Nuremburg to Frankfurt by high-speed ICE train leaving Nuremberg at 08:00 and arriving Frankfurt at 10:04. Travel from Frankfurt to Brussels by high-speed ICE train leaving Frankfurt at 10:29 (10:16 on Sundays) and arriving Brussels Midi at 13:35. Travel from Brussels to London by Eurostar, leaving Brussels Midi at 14:56 (14:52 on Sundays), arriving London St Pancras at 16:05. 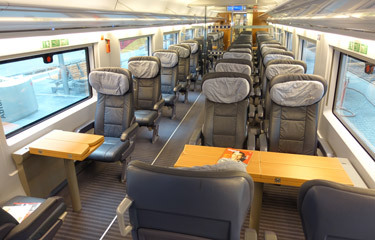 Travel from Nuremburg to Frankfurt by high-speed ICE train leaving Nuremberg at 12:00 and arriving Frankfurt at 14:04. Travel from Frankfurt to Brussels by high-speed ICE train leaving Frankfurt at 14:29 and arriving Brussels Midi at 17:35. Travel from Brussels to London by Eurostar, leaving Brussels Midi at 18:56 daily except Saturdays arriving London St Pancras at 19:57. On Saturdays, depart Brussels 20:22 and arrive London 21:33. 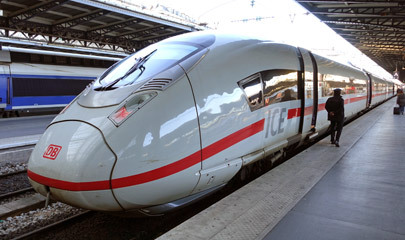 Travel from Nuremburg to Frankfurt by high-speed ICE train leaving Nuremberg at 14:00 and arriving Frankfurt at 16:04. Travel from Frankfurt to Brussels by high-speed ICE train leaving Frankfurt at 16:27 daily except Saturdays and arriving Brussels Midi at 19:35. Travel from Brussels to London by Eurostar, leaving Brussels Midi at 20:22 and arriving London St Pancras at 21:33. Step 1, buy a ticket from London to Brussels and back at www.eurostar.com. You print your own ticket, or can collect it at St Pancras. Step 2, buy an onward ticket from Brussels to Nuremberg at the German Railways website www.bahn.de. This will book Belgium Sparpreis tickets from Brussels to anywhere in Germany from €39, but only if you use one of the German ICE trains (not Thalys) between Brussels and Cologne. Bookings open 92 days before departure, but this is progressively being extended to 6 months before departure. The further ahead you book, the more likely you are to see the cheapest fare. If your journey involves a Thalys between Brussels & Cologne, or a Thalys one way and ICE the other, or you're not sure which you want. Step 1, buy a ticket from London to Cologne and back at the Belgian Railways international website www.b-europe.com. B-europe.com can book both Eurostar+Thalys and Eurostar+ICE between London & Cologne, and their booking system handles this two-leg journey well, usually seeming to find the cheapest prices. You print off your own tickets. Bookings for Eurostar & ICE open up to 180 days before departure, Thalys opens up to 120 days before departure. The further ahead you book, the more likely you are to see the cheapest fare. You can also try www.loco2.com. Step 2, buy an onward ticket from Cologne to Nuremberg at www.bahn.de. If you prefer to buy tickets by phone, call Deutsche Bahn's UK telesales line on 08718 80 80 66 (lines open 09:00-20:00 Monday-Friday, 09:00-13:00 Saturday & Sunday, no booking fee, 2% credit card charge). Click here for a list of agencies and more information on how to buy tickets. Nuremberg has a DB railway museum just 5-10 minutes walk from the station, for details & location see www.dbmuseum.de. Nuremberg's NS Rally grounds are an amazing area to visit and an important historical reminder which should not be missed. To reach them, either take Tram 9 from its terminus right outside Nuremberg Hbf to the tram stop right outside the Dokumentation Centre (buy a tram ticket from the machines at the tram stop) or take suburban S-Bahn train S2 every 20-40 minutes from Nuremberg Hbf to Nuremberg-Dutzendteich (journey tome 6 minutes, it's a 5 min walk from the Dokumentation Centre) or Nuremberg-Frankenstadion which is an 8 minute train ride, located just 2 minutes walk from the Zeppelin Field. The Zeppelin field is freely accessible at all times of day, there's no entrance fee. When I visited I was the only person there. Incidentally, the courthouse where the famous post-war trials were held is west and a little north of Nuremberg station. Nuremberg has a pleasant old town just 5 minutes walk from the station, and in November-December you'll find an extensive Christmas market there. There are several good options for travel between the UK and Hamburg. Option 1, by Eurostar & high-speed trains: Travel by high-speed train from London to Brussels, Cologne, then Osnabruck, Bremen or Hamburg from as little as €69.90 each way. 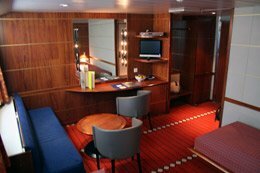 Option 2, by Harwich-Hoek overnight ferry with private cabin with shower, toilet, satellite TV & free WiFi, then daytime trains. InterCity 1st class, often available in both open-plan saloons like this and in compartments. How to read these timetables... Each column is a service, and you read downwards. There's a change of trains at each of the grey bars. m = leaves from Cologne Deutz/Messe, just the other side of the Rhine from Cologne Hbf, easily reached by frequent S-bahn local train. t = by high-speed Thalys train not ICE, DB Sparpreis London fares not available. In Brussels I recommend the Ibis Brussels Midi just across the road from the station or the Pullman Hotel Brussels Midi, a more upmarket option above the station itself. In Cologne, try the Breslauer Hof Am Dom, Hotel Domspitzen, CityClass Hotel Europa am Dom, Hilton Cologne, Excelsior Hotel Ernst am Dom. Map of Hamburg showing the Hauptbahnhof Hbf = Hauptbahnhof = main station. If you have a first class ticket (but not super-sparpreis) you can use the DB Lounges at Cologne, Bremen & Hamburg. What is Eurostar like? What are Thalys trains like? What are ICE trains like? What are IC trains like? London St Pancras station guide Brussels Midi station guide & advice on changing trains Cologne Hbf station guide. You can check these train times at www.bahn.de. London to Hamburg or any other city in Germany starts at €69.90 each way 2nd class or €129.90 in 1st class with a German Railways Sparpreis London fare. Sparpreis London fares are only available if you use German ICE trains between Brussels & Cologne. If you want to use Thalys, fares from London to Cologne start at £50 one-way or £89 return, then you can add a German railways domestic sparpreis ticket between Cologne & Hamburg from €29 each way. This tends to make using Thalys more expensive, though not always. You can easily buy a cheap Sparpreis London fare between London and Hamburg or anywhere in Germany direct from German Railways website www.bahn.de using the special links below. All you need to do is enter your date of travel. Anyone from any country can book this way, as international credit cards are accepted and you print your own online ticket. Departing London at 19:34 every day with overnight stop in Brussels & 06:25 departure next morning. Departing London at 19:34 every day as above but with a more civilised 08:23 departure from Brussels. Departing London at 19:34 every day as above but with a leisurely 10:25 departure from Brussels. For an overnight hotel in Brussels I suggest Ibis Brussels Midi. Seat reservations: A seat reservation on the Eurostar is automatically included with your Sparpreis London ticket free of charge. Seat reservations are optional on ICE & IC trains, if you want a reserved seat it can be added during the booking process for fee of around €4.50 each way. You only pay 1 fee to reserve a seat on both trains. Stopovers: As with other German Railways Sparpreis fares, Sparpreis London tickets allow up to 2 stopovers of up to 48 hours each to be incorporated in your booking using the Add intermediate stops link. You simply specify the duration of the stopover in hours & minutes in the hh:mm box. Why not stop off in Brussels or Cologne? Step 2, now buy a ticket from Brussels to Hamburg using the journey planner at the German Railways website www.bahn.de, again using the train times on this page as a guide. They have Belgium Sparpreis tickets between Brussels and anywhere in Germany from just €39 each way, and you simply print out your own ticket. I recommend registering when it asks you before completing the purchase, so you can easily retrieve any bookings. Option 1, you can easily book from London to Hamburg using www.loco2.com. This links to both German Railways and French Railways systems, so can sell you a London to Hamburg journey as one transaction incorporating a London-Cologne tickets sourced from the French system plus a Cologne to Hamburg ticket sourced from the German system. In fact, it also sells Sparpreis London tickets via the ICE, so you'll see all departures this way. An added benefit is that Loco2 allows you to book through from any British station, not just London. Option 2, you can buy London to Cologne tickets at the Belgian Railways site www.b-europe.com. You can then add a Cologne-Hamburg ticket at the German Railways website, www.bahn.de. In all cases, you simply print out your own ticket. Make sure the train you book connects with the Eurostar+Thalys you have booked, using the train times on this page as a guide. At bahn.de I recommend registering when it asks you before completing the purchase, so you can easily retrieve any bookings. For holidays or short breaks to Germany by train call rail specialists Railbookers. They offer custom-made holidays & tours to Germany with trains, transfers & hotels sorted for you in one place. And as they're selling you a package they'll look after you if anything happens such as a strike or major delay. The trips you see online are examples which can be customised to include train travel to & from the UK with no flying necessary, or to add extra nights, just call them. Escorted tours: If you'd like to travel with a convivial group of travellers escorted by a professional tour guide, the two operators to check are Great Rail Journeys (www.greatrail.com, in the UK call 01904 527 120) and Rail Discoveries, www.raildiscoveries.com, 01904 730 727. Both have various escorted tours from the UK to Germany by train, with departures on a variety of dates. Option 1, by Eurostar & TGV via Paris: Take Eurostar to Paris, walk from the Gare du Nord to Gare de l'Est (10 minutes), then take a direct 200 mph double-decker TGV Duplex from Paris to Stuttgart or Munich. This is the fastest option. It involves an easy 10-minute walk between stations in Paris. Option 2, by Eurostar & ICE high-speed trains via Brussels: Take Eurostar to Brussels, a high-speed Thalys or ICE train to Cologne, then a high-speed ICE train from Cologne to Munich. This is the most frequent option with several services daily. It involves two easy same-station changes of train. Option 3, by Eurostar & Cologne-Munich sleeper train. A time-effective option, though slower than using daytime trains. 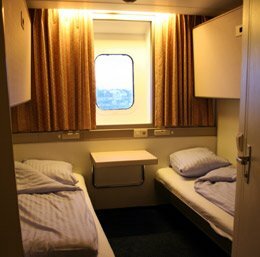 Option 4, by Harwich-Hoek overnight ferry with private cabin with shower, toilet, satellite TV & free WiFi, then daytime trains. The TGV-Est high-speed line opened in June 2007 with a final section opening in July 2016. Impressive 200mph double-deck TGV Duplex trains now link Paris & Stuttgart in 3 hours 9 minutes at up to 320km/h (200 mph), with one a day going direct to Munich - watch the video guide. This makes for a fast and easy train journey from London. Make sure you select a top deck seat for the best views. There's a cafe-bar on board and all seats have power sockets for laptops and mobiles. * = change in Stuttgart. The Paris-Munich train without any asterisks is direct. ** = the 05:40 Eurostar from London to Paris will not run from 29 July to 1 September. Eurostar times may vary slightly, so always double-check when booking. From €39.90 each way in 2nd class. Price varies, book in advance to get these fares. Full price €139 each way. 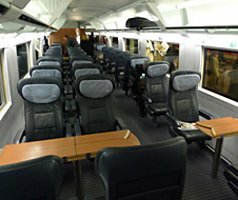 The easiest & cheapest way to buy London-Munich or London-Stuttgart train tickets for journeys via Paris is online at www.loco2.com. 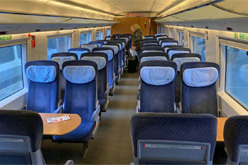 In fact, using www.loco2.com you can book not just from London but from any station in Britain to Stuttgart or Munich. Booking for the Paris-Germany TGVs now usually opens 120 days (4 months) ahead. www.loco2.com can book journeys to Stuttgart or Munich via both Brussels or Paris. If you specifically want the Paris route, simply click '+ Add via/stopover' and enter Paris Nord as a 'via'. It's also worth checking prices for the Paris-Munich train on www.bahn.de, as this is the German reservation system and prices vary from those on the French system used by www.raileurope.co.uk. In addition, child age limits are different if you book using bahn.de: Children under 6 go free, and children under 15 also go free if accompanying a fare-paying adult. Booking this way involves two websites, so do a dry run first on both sites to check prices and availability before booking for real. 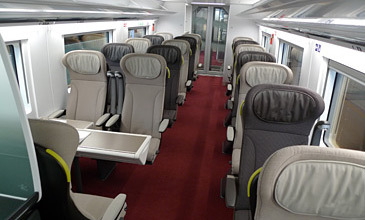 Booking for both Eurostar and the Paris-Munich TGVs now opens 4 months before departure. Step 1, go to www.bahn.de, the German Railways website, and book from Paris to Munich & back. The results will show cheap Sparpreis fares (if available). You pay by credit card and simply print out your own ticket. Easy! The prices shown on www.bahn.de are in euros, and are the total cost for all passengers selected, not per person. I recommend registering when it asks you before completing the purchase, so you can easily retrieve any bookings later. Always book this train first and check its exact arrival & departure times before booking the Eurostar connection, as times can vary. Sit back with a glass of red and enjoy the ride - book an upper deck seat for the best views. The train is equipped with power sockets for laptops & mobiles at all seats in both classes, and a cafe-bar serves drinks, snacks & microwaved hot dishes. The train soon leaves the Paris suburbs behind and speeds across a vast wide open plateau of woods & farmland at up to 200mph, past picturesque French villages of the Champagne region. An hour or two later, the train leaves the high-speed line and slowly meanders through pretty wooded hills, the countryside eventually flattening out towards Strasbourg. On leaving Strasbourg, look out for Strasbourg cathedral on the left with its famously missing second tower. Minutes afterwards you rumble across the river Rhine into Germany, before heading on to Stuttgart & Munich. See Munich Hbf station information. 2nd class seats on the upper deck. There's a mix or tables for 4 and unidirectional seating. 360º photo..
Option 2: London to Stuttgart & Munich via ICE from Brussels, from €69.90. An ICE3 at Cologne Hauptbahnhof, used on the trains to Munich. More info about ICE. Change in Brussels onto a high-speed ICE train, see tip about short cut. Trains marked t are Thalys trains, not ICE. m = change trains at Mannheim. t = by high-speed Thalys train not ICE, DB Sparpreis London fares aren't available via Thalys. Shaded = time-effective journey with overnight hotel stop in Brussels, Cologne or Frankfurt. In Brussels, try the Ibis Brussels Midi just across the road from the station or the Pullman Hotel Brussels Midi, a more upmarket option above the station itself. In Cologne, try the Breslauer Hof Am Dom, Hotel Domspitzen, CityClass Hotel Europa am Dom, Hilton Cologne, Excelsior Hotel Ernst am Dom. Always check times for your date of travel using www.bahn.de. There are additional Cologne-Munich trains running via Nuremberg, not shown here. Hbf = Hauptbahnhof = main station. If you have a first class ticket (but not super-sparpreis) you can use the DB Lounges at Cologne, Stuttgart & Munich. What is Eurostar like? 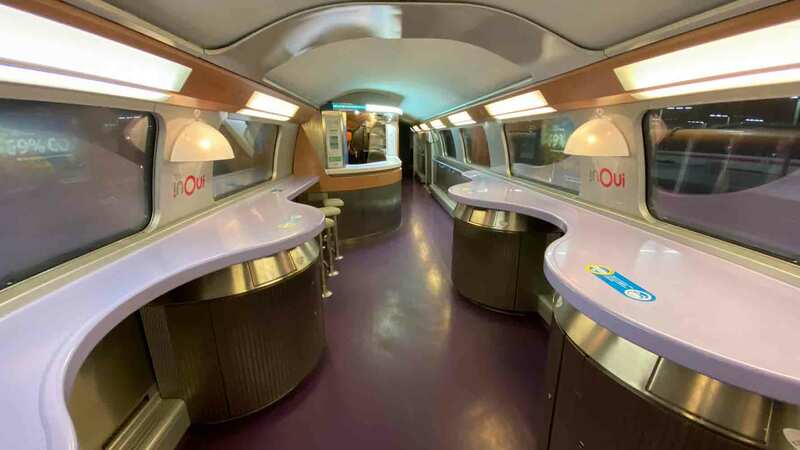 What are Thalys trains like? What are ICE trains like? 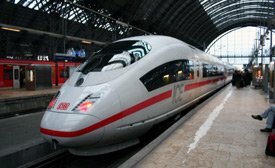 London to Munich or Stuttgart or any other city in Germany starts at €69.90 each way 2nd class or €129.90 in 1st class with a German Railways Sparpreis London fare. Sparpreis London fares are only available if you use a German ICE train between Brussels & Cologne. If you want to use Thalys, fares from London to Cologne start at £50 one-way or £89 return, then you can add a German railways domestic Sparpreis ticket between Cologne & Munich from €29 each way. This tends to make using Thalys more expensive, though not always. You can easily buy a cheap Sparpreis London fare between London and Munich or anywhere in Germany direct from German Railways website www.bahn.de using the special links below. All you need to do is enter your date of travel. Anyone from any country can book this way, as international credit cards are accepted and you print your own online ticket. Booking opens up to 180 days before departure, but remember that the 180 days can get squeezed to as little as 60 days for dates immediately after the Europe-wide timetable changes in mid-June and mid-December. Departing London at 19:34 every day as above, but with more civilised 08:23 departure. Departing London at 19:34 every day as above, but with leisurely 10:25 departure. For a hotel in Brussels I recommend the Ibis Brussels Midi across the road from the station. When an overnight stop is involved, click Add intermediate stops & adjust stopover duration & departure time to get the trains you want. 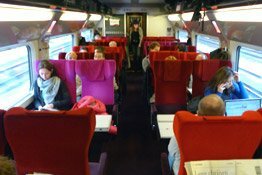 Seat reservations: A seat reservation on the Eurostar is automatically included with your Sparpreis London ticket free of charge. 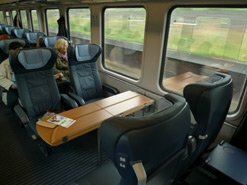 Seat reservations are optional on ICE or IC trains, if you want a reserved seat it can be added during the booking process for fee of around €4.50 each way. You only pay 1 fee to reserve a seat on both ICEs. Step 1, buy a Eurostar ticket from London to Brussels at www.eurostar.com using the train times on this page as a guide. The further ahead you book, the more likely you are to see the cheapest fares. Tickets can be self-printed, collected at London St Pancras or posted to any UK address. If you buy direct from Eurostar you get the chance to select an exact seat on board the Eurostar using the 'Manage a booking' link on their home page after you've bought your ticket. Step 2, now buy a ticket from Brussels to Berlin using the journey planner at the German Railways website www.bahn.de, again using the train times on this page as a guide. They have Belgium Sparpreis tickets between Brussels and anywhere in Germany from just €39 each way, and you simply print out your own ticket. I recommend registering when it asks you before completing the purchase, so you can easily retrieve any bookings. Option 1, you can easily book from London to Berlin using www.loco2.com. This links to both German Railways and French Railways systems, so can sell you a London to Berlin journey as one transaction incorporating a London-Cologne tickets sourced from the French system plus a Cologne to Munich ticket sourced from the German system. In fact, it also sells Sparpreis London tickets via the ICE, so you'll see all departures this way. An added benefit is that Loco2 allows you to book through from any British station, not just London. Option 2, you can buy London to Cologne through tickets at the Belgian Railways site www.b-europe.com. You can then add a Cologne-Munich ticket using the German Railways website, www.bahn.de. In all cases, you simply print out your own ticket. Obviously, make sure the train you book connects with the Eurostar+Thalys you have booked, using the train times on this page as a guide. At bahn.de I recommend registering when it asks you before completing the purchase, so you can easily retrieve any bookings. Option 3, London to Munich via the Cologne-Munich sleeper. This is a time-effective way to go, though not as fast as using daytime trains. ÖBB Austrian Railways are starting a new Cologne-Munich sleeper from the timetable change on 11 December 2016, part of their new Nightjet brand. 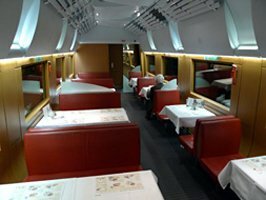 This is a comfortable Austrian-run Nightjet train and it gives you a the wonderful evening ride along the Rhine Valley. In the evening light in summer or by moonlight in winter, you'll pass castles and vineyards along the sparkling waters of the Rhine, passing the legendary Lorelei Rock. You can recognise the Lorelei from the word Lorelei painted in black on a white background just above the water line on the opposite bank, and from the two flags flying on its summit. Travel from London to Brussels by Eurostar, leaving London St Pancras at 12:58 and arriving in Brussels Midi at 16:08. Travel from Brussels to Cologne by high-speed Thalys train, leaving Brussels Midi at 17:27, arriving Cologne Hbf 19:15. Dinner in Cologne before boarding the sleeper? 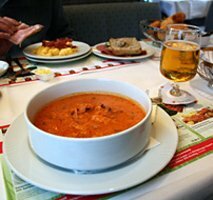 Have dinner in Cologne, as there's no restaurant car on the sleeper train. For a traditional German meal in Cologne, try the excellent Brauhaus Sion (www.brauhaus-sion.de), 5 minutes walk from Cologne Hbf, or the Malzmuehle restaurant (www.muehlenkoelsch.de), 10-15 minutes walk from Cologne Hauptbahnhof, or there's a restaurant in the Hauptbahnhof itself at the Schweinske, www.schweinske.de. Feedback appreciated! Travel from Cologne to Munich on the excellent Nightjet sleeper train, leaving Cologne Hbf daily at 21:21 and arriving at Munich Hbf at 07:12. This comfortable Austrian Nightjet sleeper train has an air-conditioned sleeping-car (1, 2 & 3-berth compartments with washbasin, plus three deluxe compartments with 1, 2 or 3 beds with private shower & toilet), couchette cars (4 & 6 berth compartments) & ordinary seats. The sleeper & couchette fares include a light breakfast with tea or coffee in the morning. See the Nightjet guide. The train travels along the famous Rhine Valley between Koblenz and Mainz, so if you are in a sleeper and your compartment happens to be on the left-hand side of the train, switch off the lights and watch the Rhine pass by, mountains, vineyards, castles & the legendary Lorelei Rock lit by moonlight, while sipping a glass of Riesling. Wonderful! Travel from Munich to Cologne by daily Nightjet sleeper train, leaving Munich Hbf at 22:52 and arriving at Cologne Hbf at 08:15 next morning. This train runs along the scenic Rhine Valley on the morning, between Mainz and Koblenz, reached at 07:05. You'll pass mountains, vineyards, river boats, castles and the legendary Lorelei Rock. Travel from Cologne to Brussels by high-speed ICE train, leaving Cologne Hbf at 09:43 and arriving Brussels Midi at 11:35. Travel from Brussels to London by Eurostar, leaving Brussels Midi at 12:52 (14:52 Sundays) arriving London St Pancras 14:05 (16:05 Sundays). London to Cologne starts at €59.90 each way in 2nd class or €109.90 in 1st class. Cologne to Munich by Nightjet starts at €59 each way with a couchette in 6-berth, €69 with a couchette in 4-berth, €99 with a bed in a 2-bed sleeper or €129 in a single-bed sleeper. Fares vary like air fares, so book early for the cheapest prices. Buying online is easy. You need to book in two stages, London to Cologne and Cologne to Munich, so note down the dates and trains you want to book using the times given above. Obviously, remember that your date of travel from Cologne back to Brussels will be the day after your departure from Munich to Cologne! Booking usually up to 120 days before departure for Thalys, up to 180 days ahead for Nightjet & Eurostar, you can't book before reservations open. The booking horizon can be squeezed to as little as 60 days for dates after the annual timetable changes in mid-June and mid-December. I suggest doing a dry run on both sites to check prices and availability before booking for real. Step 1, go to the Belgian Railways international website www.b-europe.com and book a ticket from London to Cologne and back using the train times on this page as a guide. You print off your own tickets. B-europe.com can book both Eurostar+Thalys and Eurostar+ICE, and their booking system handles this two-leg journey well, usually seeming to find the cheapest prices. Make sure you allow plenty of time for the connection in Cologne, preferably at least an hour when connecting with a sleeper train. It's obvious, but remember that your return departure date from Cologne will be the day after your departure date from Vienna! By all means take an earlier train from London to Cologne, or a later train returning from Cologne to London, if this has cheaper fares available or if you'd like some time in Cologne. Alternatively, you can book London or from any station in Britain to Cologne at www.loco2.com. Step 2, go to the German Railways website, www.bahn.de, and use the journey planner to book from Cologne to Munich and back, looking for the direct nightjet train with 0 changes. You print out your own ticket. I strongly recommend registering when prompted, so you can log in later and re-print any tickets at any time from any PC. I recommend also checking prices at www.trainline.eu, this links to the Austrian Railways ticketing system which controls price buckets separately from the Germans so can sometimes be cheaper. Again, look for the direct nightjet train with 0 changes, and you also print your own ticket. To buy tickets by phone, call International Rail on 0844 248 248 3, lines open 09:00-17:00 Monday-Friday. Overseas callers call +44 844 2482483. Remember to book early for the cheapest prices, ideally 2-3 months ahead, as just like air fares prices increase closer to departure. International Rail are equipped with both the French and German rail ticketing systems, so can offer the best prices all the trains between London and Austria. They charge a £10 booking fee for bookings under £100, £20 for £100-£300, £30 above £300. In many cases tickets can be emailed to you as e-tickets, so there's no postage fee or delay. Alternatively, you can call Deutsche Bahn's UK telesales line on 08718 80 80 66 (lines open 09:00-20:00 Monday-Friday, 09:00-13:00 Saturday & Sunday, no booking fee, 2% credit card charge). Click here for more information on how to buy European train tickets. 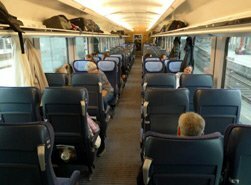 This is the cheapest option, London to Leipzig or Dresden in a single day. You can of course break up the journey with an overnight stop in Brussels or Cologne if you like. You can leave London St Pancras by Eurostar at 06:13 or 06:47 on Mondays-Fridays, 06:57 on Saturdays, change at Brussels & Frankfurt and arrive Leipzig Hbf 17:09 or Dresden Hbf 18:36. You can leave London St Pancras by Eurostar at 08:55 Fridays & Sunday only until 6 April 2019, every day of the week from 7 April onwards, change at Brussels & Frankfurt and arrive Leipzig Hbf 19:10 & Dresden Hbf 21:38. You can leave London St Pancras by Eurostar at 10:58, change at Brussels & Frankfurt and arrive Leipzig Hbf 21:09 or (change again at Leipzig) Dresden Hbf 22:36. With overnight stop in Cologne: Travel from London to Cologne on any of the services shown in the London to Cologne section. For example, you can leave London St Pancras at 15:04 daily, change at Brussels Midi and arrive Cologne Hbf at 20:15. Stay overnight in Cologne. Next morning travel by train from Cologne Hbf to Leipzig in as little as 4h23, or to Dresden in as little as 5h42. With overnight stop in Brussels: Travel from London to Brussels on any afternoon or evening Eurostar you like. The last one goes at 19:34, journey time 2 hours. Stay overnight in Brussels - I recommend the Ibis Brussels Midi, just across the road from Brussels Midi station. Next morning travel by train from Brussels to Leipzig in around 6h58, or to Dresden in 8h11. You can leave Dresden at 05:21 Mondays-Saturdays or Leipzig at 06:48 Mondays-Saturdays, changing at Leipzig, Frankfurt and Brussels to arrive London St Pancras at 16:05. You can leave Dresden at 08:21 or Leipzig at 10:48 any day, changing at Frankfurt and Brussels to arrive London St Pancras at 19:57 (21:33 on Saturdays). You can leave Dresden at 10:20 or Leipzig at 12:48 daily except Saturdays, changing at Frankfurt and Brussels to arrive London St Pancras at 21:33. With overnight stop in Brussels: Travel from Dresden or Leipzig to Brussels, you can check times at www.bahn.de. For example, you can leave Dresden at 12:21 or Leipzig at 14:48, arriving Brussels at 21:35. Stay overnight in Brussels - I recommend the Ibis Brussels Midi, just across the road from Brussels Midi station. Next morning, take any Eurostar you like to London St Pancras, the first one leaves at 07:56 on Mondays-Saturdays arriving 08:57, or 08:52 on Sundays arriving 09:57. With overnight stop in Cologne: Travel from Dresden or Leipzig to Cologne, you can check times at www.bahn.de. For example, you can leave Dresden at 15:21 or Leipzig at 16:37, arriving Cologne Hbf at 22:46, but by all means travel earlier. Stay overnight in Cologne. Next morning travel by train from Cologne to Brussels and on to London using any of the options shown in the London to Cologne section. For example, you can leave Cologne Hbf at 07:42, change at Brussels Midi and arrive London St Pancras at 11:57 (2 hours later on Sundays). German Railways offer Sparpreis London fares to Dresden, Leipzig or anywhere in Germany from €69.90 each way in 2nd class or from €129.90 each way in 1st class. I have set up these links with the necessary parameters - just click and enter your dates of travel to check for a Sparpreis London fare from London to Leipzig or Dresden. You print your own ticket. 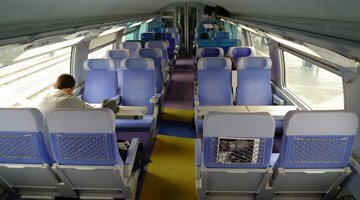 Seat reservations: A seat reservation on the Eurostar is automatically included with your Sparpreis London ticket free of charge. Seat reservations are optional on ICE or IC trains, if you want a reserved seat it can be added during the booking process for fee of around €4.50 each way. You only pay 1 fee to reserve a seat on multiple ICEs. Now part of WW2 folklore and well worth a visit. A train leaves Leipzig every hour (usually at .15 minutes past the even hour) for Grossbothen (or on some departures, Grimma) where a bus connects for Colditz. Journey from Leipzig about 1 hour 7 minutess. You can check train and bus times at www.bahn.de. In 1992, I made the whole journey from Leipzig to Colditz by train, as did many of the PoWs. 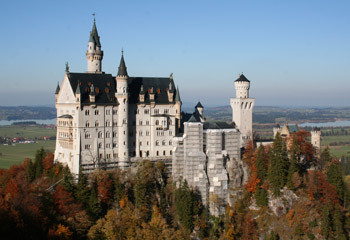 Neuschwanstein Castle, one of King Ludwig II of Bavaria's fairytale castles. Find out how to visit it as a day trip from Munich here. You can get to just about anywhere in Germany by train from London. 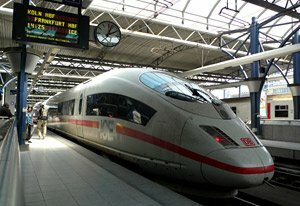 If your destination is a small place close to one of the big cities shown on this page such as Berlin, Hamburg or Munich, use the train times on this page to that city then use the German Railways website www.bahn.de to find train times onwards from that city to your final destination. The German Railways website will also give fares and sell tickets for journeys within Germany. Why are these links clever? Well, Sparpreis London fares are only valid on a combination of Eurostar from London to Brussels and the German ICE from Brussels to Cologne. You won't find them on any journeys involving the competing Thalys train between Brussels and Cologne. On some departures from London, a Thalys happens to be the fastest connection with the Eurostar in question, so the bahn.de journey planner only offers the Thalys (and not the ICE leaving an hour afterwards) and so doesn't offer any cheap fares. However, by typing Brussels in the 'via' box and 01:00, 01:30 or 02:30 in the 'stopover' box, you can force the journey planner to allow a 1 hour, 1½ or 2½ hour stopover in Brussels, calculated so that it ignores the immediate Thalys connection and instead finds the following train to Cologne, which happens to be an ICE, and so it offers the cheap fares. I've incorporated this fiddle factor in the links above so you don't have to worry about it. 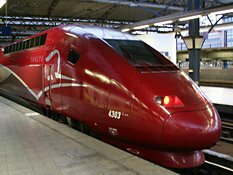 Other ways to buy train tickets to Germany: If there are no cheap Sparpreis London fares available on the day you want, or if you want to use one of the other services involving Thalys trains between Brussels & Cologne rather than one of the German ICEs, you'll need to book in two stages using two websites. First, use Belgian Railways international website www.b-europe.com to book your chosen trains from London to Cologne & back (you can also try www.loco2.com, which will book from any station in Britain to Cologne). Then buy a connecting German ticket from Cologne to your final destination & back using www.bahn.de, with cheap Sparpreis fares from €29 each way from Cologne to any destination in Germany. Allow at least 30 minutes in Cologne to change trains. See the Neuschwanstein page for a guide to reaching Bavaria's fairytale castle, including how to make an inexpensive DIY day trip from Munich by train, with photos of a visit to the castle. See the Escape to Colditz page. Now part of WW2 folklore and well worth a visit! Colditz is easy to reach from Leipzig, or you can do it as a day trip from Berlin or Dresden. Another site from WW2 which can be visited, the site of Hitler's country house, the Berghof, can still be seen at Obersalzberg on the mountain above Berchtesgaden, where Göring, Bormann, Speer and others also had houses. The ruins of the Berghof were demolished in 1952, all that can be seen now is an overgrown site with a large retaining wall. Hitler's impressive mountain-top tea house, the Eagle's Nest, is still standing and can be visited in summer. First, travel to Munich as shown above. Travel from Munich Hauptbahnhof to Berchtesgaden by regional train, these leave every hour through the day with one simple change at Freilassing, total journey time 2 hours 35 minutes. www.bahn.de will give train times an sell you a train ticket - look for all-train departures that don't involve a bus. The regular fare is around €35 each way, so it's cheaper to buy a Bayern Ticket for €23 for the first passenger + €5 for each additional passenger, this gives unlimited travel for the day on regional trains after 09:00 on weekdays, any time at weekends so will cover a same-day round trip. Although you can buy on the day at the station, buying online at www.bahn.de saves time and the system automatically shows the Bayern Ticket for journeys where this is cheaper than the regular fare. Roughly hourly buses then link Berchtesgaden with Obersalzberg, journey time only 12 minutes, from where tourist shuttle buses go up to the Eagle's Nest. The bus operator is www.rvo-bus.de. Or take a tour - Eagles Nest Historical Tours (www.eagles-nest-historical-tours.com) do an Obersalzberg tour and an Eagles Nest tour, leaving from the tourist information centre directly across the roundabout from the station. Day 1, travel from London to Amsterdam overnight by Dutch Flyer train & ferry, leaving London's Liverpool Street station daily at 19:32 by train to Harwich International. At Harwich, the station is right next to the ferry terminal and you walk off the train into the terminal, check in at the Stena Line desk and walk straight onto the Stena Line ferry to Hoek van Holland. The ferry sails at 23:00 and arrives at Hoek van Holland at 08:00 Dutch time next morning. You can get on board the ferry before 9pm, have a late dinner in the restaurant and settle into your cabin. All passengers travel in snug private cabins with en suite toilet & shower and satellite TV. 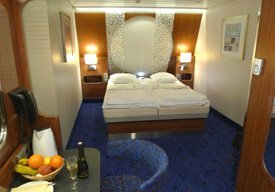 Deluxe Comfort class & Captains class cabins are also available, and there's free WiFi in the lounges, restaurants & bars on 9 deck. At Hoek, the station is right next to the ferry terminal. Hop on the temporary rail replacement bus (until some time in 2018) or the new frequent metro train (from some time in 2018 onwards) to Schiedam Centrum. If going to Hanover, Hamburg or Berlin, change at Schiedam Centrum onto an InterCity train to Amsterdam Centraal, arriving 10:55. If going to Cologne, Frankfurt, Stuttgart, Munich take a local train from Schiedam to Rotterdam Centraal arriving 09:27, and then another on to Utrecht arriving around 10:00. This Dutch Flyer London-Netherlands train & ferry service is a fully-integrated service with special fares available from London to Any Dutch Station with tickets that cover both the train to Harwich, the ferry and onward train to anywhere in the Netherlands, see the Netherlands page for full details. The same special fare from London is valid from any Abellio Greater Anglia station, for example Norwich, Cambridge, Romford, Ilford, Ipswich. Important update: Buses are replacing trains between Hoek van Holland & Schiedam Centrum from 1 April 2017 while the line is converted to light rail. New frequent metro trains will start running from some time in 2019. More details here. Day 2, travel from Amsterdam or Utrecht to anywhere in Germany, you can check times & fares and buy tickets online from Amsterdam or Utrecht to your German destination at www.bahn.de. Intercity trains link Amsterdam Centraal with Osnabruck, Hanover, Berlin every couple of hours, change at Osnabruck for Bremen & Hamburg. For example, you could leave Amsterdam Centraal at 11:01 and arrive Berlin Hbf at 17:22, see the Amsterdam to Berlin InterCity train page. Day 1: Take a train from anywhere in Germany to Amsterdam or Rotterdam. You can check train times & fares from any German station to Amsterdam or Rotterdam & buy tickets at www.bahn.de. Coming from Berlin, Hamburg, Bremen, Hannover or Osnabruck it's usually easiest to go via Amsterdam, for example, the 10:34 Intercity train from Berlin Hbf is direct to Amsterdam Centraal arriving 17:01. Coming from Munich, Stuttgart, Nuremberg, Frankfurt or Cologne it's easiest to go via Utrecht & Rotterdam. The 13:29 from Frankfurt & 14:46 from Cologne (a superb ICE train) arrives Utrecht at 17:00, then hop on the next train to Rotterdam Centraal, these trains run every 15 minutes. Day 1: Now take the 18:34 train from Amsterdam to Schiedam Centrum or the 20:02 train from Rotterdam Centraal to Schiedam Centrum to connect with the temporary rail replacement bus (until some time in 2018) or the frequent metro train (from some time in 2018 onwards) to to Hoek van Holland Haven. By all means take an earlier train/bus/metro, they run every 20-30 minutes and the ferry starts boarding at 20:00. Important update: Buses are replacing trains between Schiedam Centrum & Hoek van Holland from 1 April 2017 while the line is converted to light rail. New frequent metro trains will run from some time in 2019. More details here. At Hoek, the station is right next to the ferry terminal. 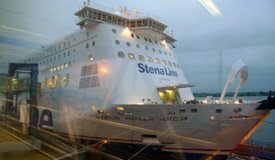 Check in at the Stena Line desk and walk up the gangway onto the ferry and sail overnight in a snug private cabin to Harwich. The ferry sails from Hoek van Holland at 22:00 and arrives at Harwich International at 06:30 next morning (day 2), UK time. All cabins have shower, toilet & satellite TV. There's free WiFi in the public areas on 9 deck. At Harwich the station is integrated with the ferry terminal, take a train on to London Liverpool Street arriving 08:48-08:59. See the Netherlands page for full details about this train & ferry service. London to Amsterdam or Utrecht starts at £55 per person each way, plus the cost of a cabin. Cabins start at £34 for a single berth cabin or £45 per cabin for a 2-berth, and are compulsory on the night sailing. The fare covers the train from London to Harwich, the ferry, and onward Dutch trains from Hoek van Holland Haven to any station in the Netherlands, see the Netherlands page for full details of fares and cabin types and costs. Utrecht or Amsterdam to Cologne starts at €19. Amsterdam to Frankfurt starts from €29, Amsterdam to Berlin from €39. Step 1, buy a Dutch Flyer train & ferry ticket from London to Amsterdam or Utrecht online as shown on the Netherlands page. Step 2, now book trains from Amsterdam or Utrecht to anywhere in Germany at German Railways website www.bahn.de. You print your own ticket. A standard Seaways class cabin with shower & toilet on DFDS Princess Seaways from Newcastle to Amsterdam. If you live in the North of England or Scotland, option 1 is to take a train up to London and travel from London to Germany as described above. This may well be the quickest & easiest option. Here's some advice on buying connecting train tickets to London. If you live in Scotland, the Caledonian Sleepers will get you up to London in time for a morning Eurostar & onwards trains to Germany. But consider option 2, by-passing London by taking a luxurious overnight cruise ferry from Newcastle to Amsterdam run by DFDS Seaways or a similar overnight ferry from Hull to Rotterdam run by P&O Ferries, then onward trains to Germany. There are direct trains from Holland to Osnabruck, Hannover, Berlin, Cologne & Frankfurt. So why not by-pass London by taking the overnight ferry to Holland, perhaps spend some time in Amsterdam, then hop on a train to Germany? Day 1, take an afternoon train from your local station to either Hull or Newcastle, whichever is most convenient for where you live. Transfer to the ferry terminal. Sail overnight by luxurious cruise ferry to Holland, with bars, restaurants & comfortable comfy cabins all with private toilet & shower, arriving next morning. DFDS (www.dfds.co.uk) sail from Newcastle to IJmuiden (near Amsterdam), P&O (www.poferries.com) sail from Hull to Rotterdam Europoort. Next morning, there's a bus transfer from the ferry terminal to the nearest main station: P&O lay on a bus transfer from Rotterdam Europoort to Rotterdam Centraal. 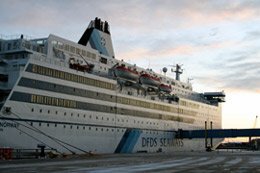 DFDS have a bus transfer from IJmuiden to Amsterdam Centraal. For full details of ferry timetables, station-port transfers, fares & how to buy tickets for travel via each of these ferry routes, see the UK-Netherlands page. Day 2, travel by train from Rotterdam Centraal or Amsterdam Centraal to anywhere in Germany. Simply use www.bahn.de to check train times & fares from Amsterdam to anywhere in Germany, and buy tickets online. For example, the 13:01 Intercity train from Amsterdam Centraal is direct to Berlin Hbf arriving 19:22, or there are later trains. A 12:40 ICE train from Amsterdam Centraal arrives Cologne at 15:19 & Frankfurt (Main) Hbf at 16:30, or there are later trains too. if you'd like to spend some time in Amsterdam. Day 1, morning: Take a train from Germany to Rotterdam Centraal (for P&O to Hull) or to Amsterdam Centraal (for DFDS to Newcastle). You can check train times & fares from anywhere in Germany to Amsterdam & buy tickets online at www.bahn.de. For example, the 08:34 Intercity train from Berlin is direct to Amsterdam Centraal arriving 15:00. The 09:29 ICE train from Frankfurt (Main) Hbf & 10:41 from Cologne arrives Amsterdam Centraal at 13:28, or there are other trains. By all means travel earlier and have more time in Amsterdam. Day 1 early evening, transfer by DFDS bus from Amsterdam Centraal to IJmuiden (for the DFDS ferry to Newcastle) or by P&O bus from Rotterdam Centraal to Rotterdam Europoort for the P&O ferry to Hull. Day 1 evening, sail overnight by luxurious cruise ferry from Rotterdam Europoort to Hull with P&O (www.poferries.com) or from IJmuiden to Newcastle with DFDS (www.dfds.co.uk), whichever UK port is most convenient for where you live, arriving next morning (day 2). Transfer to the station and take a train home. For full details of train & ferry times and how to buy tickets for each of these routes, see the UK-Netherlands page. Start with the ferry. Go to www.dfds.co.uk for Newcastle-Amsterdam, www.poferries.com for Hull-Rotterdam. Then check train times and buy train tickets to Hull or Newcastle using www.loco2.com or www.nationalrail.co.uk. Allow plenty of time for the transfer from station to port, and for the ferry check-in. Now for the onward trains from Amsterdam. Book these at www.bahn.de and print your own tickets. 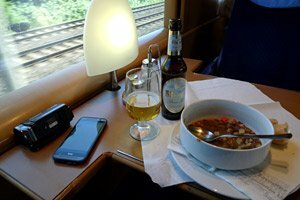 If you want a holiday to Germany by train, but want someone else to organise all the train tickets & hotels for you, several good specialist companies do just that. Railbookers offer tailor-made individual holidays with departure on any date you like, whereas Rail Discoveries & Great Rail Journeys offer escorted tours with specific departure dates. Short breaks to Cologne with train travel & hotel, check their website for prices. Short breaks to Berlin, with train travel both ways & 2 or more nights hotel. 7-night holiday to Berlin & Prague by train. Rail Discoveries offers several train-based escorted tours to Germany, with 3* hotels and travel by Eurostar and onwards high-speed train. For example, they offer a 5-day tour to the Rhine Valley, or a 6-day Rhine cruise. Check prices & departure dates at www.raildiscoveries.com, then book online or call 01904 730 727. GRJ offers five-star inclusive escorted tours to several areas in Germany, with 1st class train travel and 5* or 4* hotels. Tours include a 10-day tour to the Rhine Valley and a 12-day tour to Berlin, Dresden, Colditz & Prague, all with overland travel from London by train and a range of departure dates. Great Rail Journeys also offer holidays by train to other European countries. Check the tour details online, then call 01904 527120 to book or use their online booking form. There are two ways to cruise the wonderful Rhine Valley - as an inexpensive day trip on a scheduled KD Lines cruise, or as a multi-day trip on a full-blown cruise ship which you use as a floating hotel, staying on board in en suite cabins. Buy train tickets from London or anywhere in the UK to Koblenz from as little as €59.90 each way, as explained above. Buy a ticket for around €35 for the daily scheduled cruise from Koblenz to Rüdesheim run by the Köln-Düsseldorfer Line, www.k-d.com. Their scheduled day cruises run between April and October, there's usually a sailing from Koblenz around 09:00 arriving Rüdesheim around 15:15. You may also find an afternoon departure, leaving Koblenz around 14:00 and arriving Rüdesheim around 20:15. The cruise will take you past the Hostile Brothers' castles and the legendary Lorelei Rock. They have various other scheduled cruises starting as far north as Cologne and going as far south as Mainz, see www.k-d.com (select English top right then click ''KD Scheduled Cruises' top left). Treat the timetable as a guide, and don't book any tight connections, the Rhine boats can run late! River cruisers with private cabins, restaurants and bars cruise the Rhine on multi-day trips where you live on board and visit locations along the way. Riviera Travel, www.rivieratravel.co.uk, offers 8-day Rhine cruises from Koblenz to Switzerland with train travel by Eurostar to and from London, from around £1,199 per person. The trips cover Koblenz, the Rhine Gorge and Lorelei Rock, Strasbourg, the Black Forest, Interlaken and Lucerne. Make sure you take a good guidebook. For independent travel, the best guidebook is either the Lonely Planet or Rough Guide. Both guidebooks provide an excellent level of practical information and historical and cultural background. You won't regret buying one! Or buy the Lonely Planets from the Lonely Planet website, with shipping worldwide. Alternatively, you can download just the chapters or areas you need in .PDF format from the Lonely Planet Website, from around £2.99 or US$4.95 a chapter. www.tripadvisor.com is a good place to browse independent travellers' reviews of the main hotels. City centres and cars don't mix well, so stick with the train for city-based tours. But if you want to get out of the cities and into the countryside, hiring a car can be a great idea. Start by trying Holiday Autos, www.holidayautos.co.uk, they're part of Lastminute.com so are reliable and have a wide range of locations and very good prices. The award-winning www.carrentals.co.uk compares many different car hire companies including Holiday Autos, meaning not only a cheapest price comparison but a wider choice of hire and drop off location.